What would you do if you accidentally deleted the Photoshop file on your Mac? If you usually use Photoshop, then we guess a lot. Due to a power failure, an unexpected crash or other insignificant problem, they can lead to the work that you have been putting in for some hours to go down the drain. Mac users could find at a peculiar position since there are not many recovery options for this situation. However, you should worry not because this post today will show you how to recover deleted or unsaved PSD files securely on your Mac computer. Aside from using the third party software to recover unsaved PSD files on Mac, you can first try the built-in functions coming with Photoshop and MacOS. If it does not help, you can consider third party software. The Auto Save feature in Photoshop is also one of the best solutions to recover unsaved PSD files on your Mac. That said, to make it work, you should have already enabled this option in Photoshop app. This option is usually turned on by default, but to make sure, if you have already enabled the Auto Save option, just head to Preferences in Photoshop > File Handling… From there, check if the Automatically Save Recovery Information option is already chosen or not. Click on a Finder window, choose Go > Go to Folder… option. Under the Go to the folder, paste in the following path ~/Library/Application Support/Adobe/ and simply click on Go. Now, head to Photoshop folder and then choose AutoRecover folder. You can then find all the unsaved PSD files in Folder and then copy them to Desktop to edit more conveniently. Another method you can try is to use Time Machine backups on your Mac, which is a lifesaver in many cases. If you usually use Time Machine backups, there is a high chance of recovering the unsaved or deleted PDF files. On your Mac, press Command + Space Bar to activate Spotlight Search. Search for “Time Machine” and click on the “Top Hits” result. Your Mac will now boot into Time Machine and you will see a lot of Finder Windows on the screen. 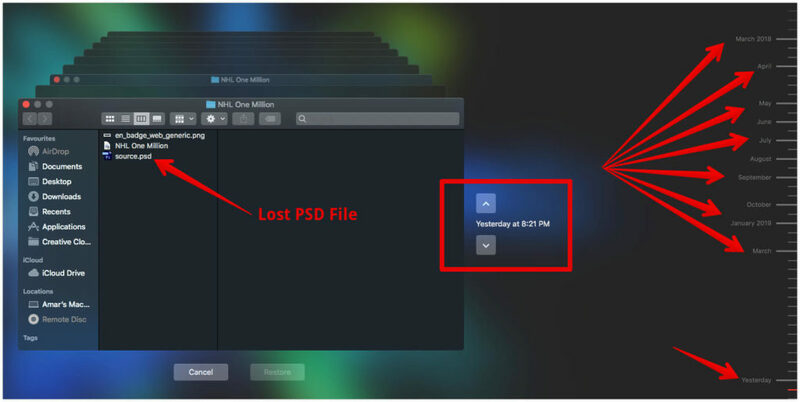 Simply head to the folder where your lost PSD file is present. You can use the Up and Down arrow marks, and check all previous backups to find out your deleted PSD file. If none of the above methods helped you, and you could not still recover your lost PSD files on Mac, you need a third party software to help you recover files. In this post, we recommend you to use EaseUS Data Recovery to recover your important PSD files. There are two scan modes in EaseUS Data Recovery Wizard for your Mac. The first one is Quick Scan mode for recently deleted files. If you have recently removed a file without overwriting anything, this mode is convenient. Another one is the Deep Scan mode under the Quick Scan mode, which could deeply search your deleted files to find out all recoverable content in your device storage. The software is very easy to use and you just need a few steps to recover your files. First, download the software from this link. The free version includes all features that the pro version has except for a size cap. After you download the setup file, simply run the installer and then install it on your Mac. Once done, open the tool and you can then choose a location to begin scanning the files. Simply choose the storage location such as your hard drive, SSD, or other external storage devices where you would like to recover the files from. EaseUS Data Recovery will now start scanning the chosen location. The results will show up in real time before the scan is completed. After the process is completed, you will receive a Recovery Completed notification that shows the location of the recovered files.